Helping Kids 'Own' Their Diabetes Diabetes now affects nearly one in 12 Americans, and the number is greater among Latinos, African-Americans and Native-Americans. To learn exactly what diabetes is and how to manage it in children and teens, host Michel Martin speaks with two health professionals and two different parents whose children have Type I and II diabetes. Diabetes now affects nearly one in 12 Americans, and the number is greater among Latinos, African-Americans and Native-Americans. To learn exactly what diabetes is and how to manage it in children and teens, host Michel Martin speaks with two health professionals and two different parents whose children have Type I and II diabetes. MICHEL MARTIN, host: I'm Michel Martin, and this is TELL ME MORE from NPR News. They say it takes a village to raise a child, but maybe you just need a few moms in your corner. Every week, we check in with a diverse group of parents for their commonsense and savvy parenting advice. Today, we have the latest in our occasional series on chronic health conditions that affect kids and families. And today, we are talking about diabetes. Nearly one in 12 Americans now has this disease. And that percentage is even greater among African-Americans, Latinos and Native Americans. For those who have diabetes, the finger pricks, the sugar checks, health issues and hospital visits can be a difficult ordeal. And that's particularly true for kids and teens and of course, for their parents. 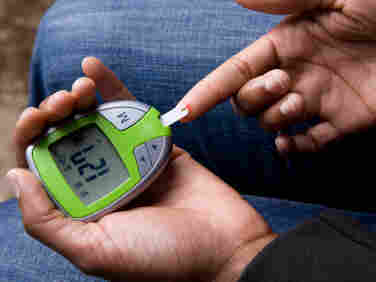 But many people still don't understand what diabetes really is, and how it can be managed. So we've called on a couple of experts and parents who are managing their children's diabetes, to help us understand how to deal with this chronic condition. Rita Jolly(ph) is with us. She has two children and three grandchildren, and her 15-year-old daughter has Type 2 diabetes. Jeff Kolok is a dad, and two of his three children have Type 1 diabetes. He also runs the support website ParentingDiabeticKids.com. Dr. Leslie Walker is a pediatrician at Seattle Children's Hospital. She checks in with us from time to time, to talk about health issues. And she's back with us. And also with us, Shavon Arline. She's the health programs director of the NAACP, the national civil rights organization. And I want to thank you all so much for joining us. JEFF KOLOK: Thanks for having us. Dr. LESLIE WALKER: Thank you. MARTIN: Dr. Walker, could you just set the table for us? And remind us exactly what diabetes is, and what's the difference between Type 1 and Type 2? WALKER: Well, there's the pancreas isn't producing enough insulin, and that's when you get Type 1 - or when people actually give themselves insulin. And then there's Type 2, where the body is producing insulin, but it's resistant to the insulin that it's producing. So you try to do things to increase the sensitivity of their bodies to insulin. MARTIN: And are either or both of these conditions genetic? And are either or both of these conditions related to lifestyle issues like diet and exercise? WALKER: Both of them can have a genetic component. It's not always assumed that if your mother has it and your father has it, that you will have it. But in families with the resistant bodies to insulin, yes, there's a much stronger genetic component. But there's also a genetic component for the Type 1, or the people who aren't producing enough insulin. MARTIN: But one of these is associated - are both of them, or either of them, affected by lifestyle issues like diet and exercise? WALKER: Both of them are very much affected. But the people who are resistant to the insulin, the more weight you have, or the bigger you become weight-wise, the less sensitive you are to your insulin. So it works less for you. So people who are obese or, you know, in our country, we're having an increasing obesity. Now, we see a lot more with Type 2 because the obesity is going up. So those people have an increased resistance to their insulin. MARTIN: I wanted to ask each of our parents, now, how they figured it out. Like, Rita Jolly, why don't you start? Your daughter, Janelia(ph), has Type 2 diabetes. And she was diagnosed around the age of 9. How did you figure it out? JOLLY: Actually, I was in the clinic one day and a clerk, or an administrative assistant, which worked in the endocrine department noticed that there's a trend in children who have Type 2. It's a pigment that appears on the back of the neck. And I noticed that on the back of her neck, and inquired. JOLLY: She - as her doctor said, she's always ran a little overweight, to put it nicely. MARTIN: Oh, she was overweight. MARTIN: Even at 9. Jeff Kolok, what about you? You have 10-year-olds, each of them with Type 1 diabetes. How did you figure - and also, I should mention it's often called, or commonly called, juvenile diabetes because it's commonly diagnosed in childhood. But Dr. Walker - you'll correct me on this - it's not a childhood condition, per se, that juvenile diabetes isn't really accurate, correct? WALKER: Yeah. You could contract that at different ages. WALKER: It's - more likely it's kids, though. MARTIN: OK. So Jeff Kolok, how did you figure it out? MARTIN: Well, any emergency hospitalization is frightening. But once the reality set in, could you just talk about some of the range of feelings that you had, and also some of the things that parents talk about on your site? KOLOK: I think the greatest thing is - it's important to make a distinction that Type 1 diabetes is an autoimmune disease that is lethal at its onset. And we not only have to try to manage the children's blood glucose levels from going too high, but we have to make sure that they do not experience hypoglycemia, or low blood sugar. And it is a 24 hour a day, seven days a week, 365 day a year management effort. And it's - I think that it can be daunting. It can also be isolating. MARTIN: Well, I want to talk more about that in a minute. But Shavon, can you just tell us, why are there these dramatic racial disparities among people experiencing diabetes? As we've heard, it's far more present in the population now than it was in the past. But among, as we mentioned, ethnic minorities, it's even more pronounced. Why is that? ARLINE: Absolutely. I think one of the things that's important to talk about is access to care and also, healthy environments. African-American children - and the NAACP is really focusing on this area, around parent empowerment - that African-American children have more access to fast-food chains. Children of color live in those communities that may or may not have safe spaces to play, or even opportunities in schools where they have a large percentage of children eating school meals that may or may not be healthy for them. So what we're really wanting to link here, especially with the children that have Type 2 diabetes, is how we empower parents to look at policies, and look at their environments, to create a healthier space for them not only to eat well, but also to play well. Now with parents with children that are Type 1 diabetic, the parent empowerment that we are really focusing on is how to ensure that parents get the education that they need, to ensure that there are certified diabetes educators around them - especially in those areas that may or may not have quality access to care. MARTIN: If you're just joining us, you're listening to TELL ME MORE from NPR News. In this week's parenting conversation, we're talking about managing diabetes, particularly in children and teens. We're joined by Shavon Arline; that's who you just heard. She's the NAACP health programs director. Also with us, Jeff Kolok of the support website parentingdiabetickids.com; Rita Jolly(ph), who has a daughter with the disease; and Dr. Leslie Walker, a pediatrician at Seattle Children's Hospital. Dr. Walker, could you pick up on something that Jeff was talking about, about how isolating having diabetes - or having children with diabetes, and how that can be isolating? Do you hear a lot about that in your practice? Can you tell a little bit about that? WALKER: Yeah. Absolutely. I think there's two levels. I run a clinic for adolescents and you know, sometimes even the most functioning parents, family members who are raising the kid, who've accessed listservs and accessed the support groups and are really functioning - feel they're functioning well, that's the ideal. Even when their kid begins to hit 10, 12, 14, you know, it's very difficult because you have to deal, also, with the child who feels very isolated. The one thing a kid doesn't want to do is stand out. And they want to fit in. They want to be able to blend in with the kids. And if they have to go out and take checks of their glucose, if they have to take injections or take their medication, that feels different. MARTIN: So Rita, can you pick up the point here? You're saying that - what I think I'm hearing - I'm seeing - it's hard enough when your kids are little and you've got to manage everything that they eat and you're kind of more in control. But then when kids start becoming adolescents, they don't want to follow that program, necessarily. Did you experience that with your daughter? JOLLY: I did. And the other thing is, environment does play a big part. And I agree that sometimes, socially, children are not able to get out onto the playgrounds and their hierarchy in terms of physical fitness, that it becomes a problem with the obesity - which I found that that's a factor with my daughter. JOLLY: She had to step out to check her blood sugar. MARTIN: Were people not so nice about that? JOLLY: Yes. And she was very in tune with what she could eat, and what she could not eat. That meant that pizza parties were out. Birthday parties became an issue where 8, 9 years old it's very difficult to tell a 9-year-old child you have to portion this cake. You can't have icing. You need to have other things to replace that. KOLOK: Well, it's important that - and again, I can only speak from the perspective of a parent with Type 1, of children with Type 1 diabetes. We try to enable the kids, and allow for the kids, to have a slice of cake at a birthday party, they do eat pizza - as long as they're balancing that with other, nutritional foods and most importantly, at that moment, that they're administering their insulin in a way that won't cause dramatic spikes in their glucose levels. So there's - again, a great deal of pretty intensive management of those kinds of things. It's important, too, that we parents do everything we can to help the children own their disease, as opposed to allowing the disease to become this overwhelming thing that ultimately owns them. MARTIN: Well, can you help me see it? I mean, what do you mean by that? I mean, you were telling us earlier that they've got to prick their own fingers - what, eight or 10 times of day, and things like that. MARTIN: Give me a sense of what you mean by, they've got to own it. KOLOK: Well, you know, of course, when they were younger, when Nicholas and Johanna were younger, we would do more of those types of things. But they now test themselves. We help them understand what symptoms they might be experiencing, or feelings they might have, that would indicate a blood glucose level going low or high, and that they need to stop what they're doing and test. MARTIN: What was it you were feeling just now, if you don't mind my asking? MARTIN: Have to deal with. Sure. KOLOK: ...have to deal with. MARTIN: I would love to hear from each of you about what the rest of us can do to support you. What can the rest of us be doing to make your lives better? And Jeff, you want to start? KOLOK: Sure. Thank you. You know, I think that be open to understanding more about Type 1 diabetes or Type 2 diabetes. And when someone might approach you about it, just take that moment to listen and to learn a bit about it. Become an activist. If I end this interview and give you a call, Michel, and ask you to come join us on a walk to cure or something like that, we'd love to expand that role that the people in our community can play. MARTIN: Well, I'll be right there with my sneakers on. MARTIN: Rita, what about you? What can we do to help you and your daughter, and other kids like her? JOLLY: I would have to agree with Jeff. I can definitely understand and feel through the radio, exactly what he's going through in terms of, you know, the feeling of moderate isolation; watching your children have to learn so much at a young age in terms of, you know, their physical being. I would ask that the communities empower themselves with education on how the body functions. And also, portion size is a great factor in the United States of America, in what we're feeding our children as portions. MARTIN: And Shavon, what about you? What can we be doing? ARLINE: I definitely want to echo the activism conversation, and that's where the NAACP stands. We don't talk about diabetes without talking about - especially Type 2, specifically, I should say - without talking about childhood obesity. I was so glad to hear our fellow father on the line, talk about his daughter talking to her congressman. Because what we don't understand is that we have power as parents and as residents of this country to say congressmen, we need more research dollars. We need funding to find cures for diseases that affect our children. We need funding to make sure our children have healthier places to live. The NAACP stands by that in preventing obesity, preventing chronic disease. Preventing Type 1 diabetes and Type 2 has to be a parental empowerment conversation. And so we're saying parents, take over. Go to your school boards. Talk to them about what they're feeding your children. Share your stories. Having these two parents on the line has been effective. We have to tell the story about children who may or may not have access to health care, and families that are struggling, that need a voice. MARTIN: And before we let you go, Dr. Walker, I know - just pointed out that there really is no cure. Are we any closer? WALKER: It's still far off in the distance. But there's a lot of research that is going on, looking at Type 1. I think Type 2 is probably further back, in finding a cure for that. We know things to prevent it, you know, that we think for most people prevent it. But it doesn't mean that if you have perfect weight and you're eating perfectly, that you won't get Type 2, either. There are people who are not overweight, who get Type 2 diabetes. MARTIN: All right. Dr. Leslie Walker is a pediatrician at Seattle Children's Hospital. She joined us once again from member station KUOW. Jeff Kolok was with us. He has two children with Type 1 diabetes. He runs the support website parentingdiabetickids.com. He joined us from Vermont Public Radio. Rita Jolly is the mom of a 15-year-old with Type 2 diabetes. She was at member station WBUR in Boston. And also with us, Shavon Arline. She's the health programs director of the NAACP. She was nice enough to join us from KNPR in Las Vegas, and we caught up with her while traveling. I thank you all so much for joining us.